The Beautiful Heresy- Christian Universalism: Should Blacks Back Barack? I had to add a new category to my blog today. "Politics". Normally, I'm fairly involved in the political process. Dutifully, each presidential election since I was 18, I trudge down to the polls and choose what is almost always the lesser of two evils in my mind. But, this time around has been very different in that I have to question the motivations behind my choice in ways that have never been an issue before. It all changed in February last year when a little known Senator, with a funny name announced he had the audacity to run for President. I had seen Barack give a speech at the Democratic National Convention and that was about all I knew about him. It was an amazing, inspiring speech. I remember at the time all the talking heads were saying how he would be a force to be reckoned with some day in the distant future. When I heard Obama had announced his candidacy, I went to his website and listened to his speech. Somehow, I felt strangely attracted to him (in a purely non-homosexual way mind you). Was it the tone of his voice, the cadence of his speech which reminded me of my days in the Black Pentecostal church, the color of his skin or was it the audacity of his ideas? It was (and is) hard to separate. What this go-round has me aware of, more than ever, is my choice is far from objective and is based on more than just a check-list of how the candidates' positions on my pet issues line up with mine. Not many of us create a spread sheet, weight the issues and choose a candidate based on a score. There's a lot of personality in there. Certain candidates I just like or don't like. I have to work hard to overcome that. Mitt Romney is too "slick". Ron Paul might be a brilliant man but he just seems out of touch. John McCain looks "presidential". Hillary's voice is annoying. Those things come to mind no matter how hard we try to push them aside. And this year, I have the added complication of having the choice of a Black man or a woman. I've thought for a long time that it's about time for Black people, women and other "minorities" to stand up and take our place in the political process. Together, women, Blacks, Latinos, etc. far outnumber White men. But, we continue to allow them to dominate the political and economic systems in the United States. Women have had the vote for almost 100 years now. Blacks have had the vote for coming up on 150 years. Yet, neither group has been able to organize well enough to have the voice we deserve to have (based on sheer number) in the political process. We have had precious few people to support in elections. Many (most?) of us have never had the opportunity to even support a minority candidate for Senator. Having a Black candidate and a woman to support is a huge temptation put before us. What a treat! The temptation to support them simply based on the color of their skin or their gender is going to be overwhelming for many. But, that was not Martin Luther King Junior's dream. The dream is to judge a person based on the content of his character. That doesn't mean automatically throwing your support to the candidate that looks like you. As I've been following the process, I've tried to keep an open mind (even considering Republican candidates. I've never declared as a Democrat). I've been studying the candidates' positions on the issues. I have a fondness for Hillary simply because Bill was the first Black president. I also have always liked her stand on universal health coverage. As I've continued to be drawn to Obama, I've scrutinized my choice- probably more so than ever. If anything, there may have been a little reverse racism going on there. I was going to support Hillary unless Barack could really sell me. Race is a funny thing. Obama's mother is White. Yet, everybody calls him Black. Tiger Woods is a multi-racial guy. He tries to de-emphasize race and gets slammed by the Black community for it. One of the reasons Tiger is my favorite athlete (maybe of all time) is because of his de-emphasis on race. He will not allow it to define him. Barack is walking a fine line, trying to garner Black support (which he will need) without alienating Whites. If Whites perceive him to be the Black Messiah, they'll run from him in droves. He needs the advantage in the Black community to overcome the advantage the other candidates will have in the majority White community. The dream hasn't been realized yet. OK. So, I admit it'd be cool to have a president who looks like me. 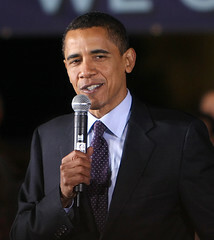 It'd be cool to hear a State of the Union from a man who can give me goosebumps when he speaks. But, there is more to Barack Obama, for me. I gave myself this test to answer the question of whether I would vote for a candidate simply because he is Black. Would I vote for Jessie Jackson or (gulp) Al Sharpton for anything? The answer is "no". I wouldn't vote for Al for dog-catcher. To get my vote, the candidate must be qualified. Last night in the exit polls, Americans said they wanted to vote for someone who shares their values. What I realized is Barack Obama does share my values. He's a member of the United Church of Christ, which I think has influenced his thinking on social justice and on the possibility of bringing G-d's justice to earth. I love his blatant enthusiasm and optimism and his we can do anything we set our minds to attitude. I love the fact he is encouraging people to believe in themselves. I love that he has who had given up on the political process fired up enough to get involved in it again. Until yesterday, I was still on the fence. I was wavering back and forth between Barack and Hillary. I was still looking at McCain and sorry that Giuliani had dropped out. But, two things happened. 1.) I saw the "Yes I Can" video by Will.i.am. No. I'm not going to vote for someone based on a video. But, the way his speech brought people together was moving to me. and 2.) Super Tuesday showed the race is so close between Barack and Hillary. Personally, I think Democrats are blessed (finally) to have two very strong candidates. But, I do have a preference for Barack over Hillary. So, I will be supporting Barack Obama for president. But, not because he's Black.